Cod: SI-04 Weight: 250 gr. 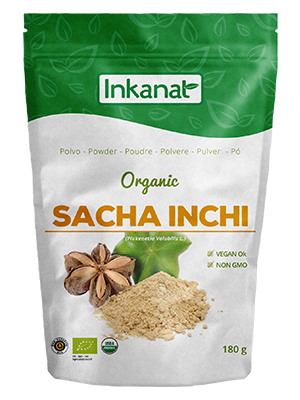 Sacha Inchi Powder is food high in protein (over 50%), rich in vitamins A and E.
Scientific Name: Plukenetia Volubilis L.
Sacha Inchi Oil is 100% pure and natural, no preservatives, artificial flavors or colors. Antioxidants: Vitamin A and alpha-tocopherol vitamin E.
Protein: over 60% of the defatted almond is high quality complete protein (99% digestible). Oral: take one spoonful (in any liquid of your preference) in the morning and one in the night. No contraindications have been reported.